It's actually wrong to call it a proper restaurant. Although the recently opened Hamilton branch has a dine-in option, the original branch in Southampton only serves take away food. There is no dining room there. However there is an open air patio with three dining tables where you may choose to have your food. But there is no dining service as such. Now coming to the strategic advantages of this eatery... there are actually quite a few. First the Chinese and Sushi food preparations are really nice and it's picking up with the locals. The packed food is served really hot and straight out of the wok. So you can expect hot food made out of fresh ingredients purchased from the local markets. Second, if you happen to be staying or living in Southampton, you know that there aren't any cheap eateries there. For those who stay at the Hotel Fairmont Southampton, this can provide a great relief and respite from having to pay five star prices for food everyday in the hotel's in-house restaurants. 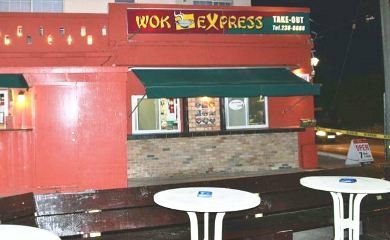 From the point where the hotel shuttle drops you at the Middle road, you can just walk for about 5-7 minutes and reach Wok Express. While the food isn't too cheap here, but by Bermuda standards it does fall into the budget category. For example an appetizer or salad would range from $7 to $10, Soup $5 to $7, where as a main course or entree would be around $12 to $16. The third advantage is, the menu is quite elaborate although it's a tiny take away place. They serve breakfast, lunch and dinner. For breakfast, items include eggs of your choice with toast, hash brown, bacon or ham or sausage, mushrooms sandwiches (of your choice), Cheddar or Swiss Cheese, Mozzarella, French Toast, Muffins, Croissant, Bagel etc. For lunch and dinner, you have a wide choice of items. In appetizers and salads the items include homemade Hummus, Falafel, Fried Calamari, Mozzarella Sticks, Fried Chicken Wings or Chicken Tenders, Caesar salad etc. They also serve baguettes, wraps and paninis with chicken, fish & turkey fills as well as burgers. One of our favorites is the Chicken Shawarma made on shawarma grill and prepared with onions, parsley and grilled tomatoes and served with a warm garlic wrap. They also offer nice Fish & Chips. In Sushi, you get tempuras prepared of shrimp, crab, tuna etc, Nigiris, Nori Maki of various types and many different types of nori maki rolls. In Chinese there are different types of soups. In main courses, you get chicken, fish, shrimp, vegetables or tofu, beef, pork etc. They all come with different preparations like Sweet & Sour, Ginger & Garlic, Lemon, Szechwan, Kung Po Style, Stir Fry etc. Each dish includes steamed rice. You can also order for fried rice or chowmein of different types. They also serve milkshakes (of different flavors), smoothies and even wine, beer and sodas. The waiting time is about 10 to 15 minutes after you order. The portions are good. The service is friendly and good as well. Overall the food is tasty and fresh. One of the disadvantages of the Wok Express in Southampton is its parking arrangement. The parking is very limited and often remains full. Wok Express also offers catering service for private functions. 1) Check out Restaurants in Southampton know about all the great restaurants & bars in and around Southampton parish. 2) Check out Top Cheap Restaurants for all our favorite budget restaurants in Bermuda. 4) Check out Southampton Parish to know about the parish including all its attractions, activities, hotels and other information.